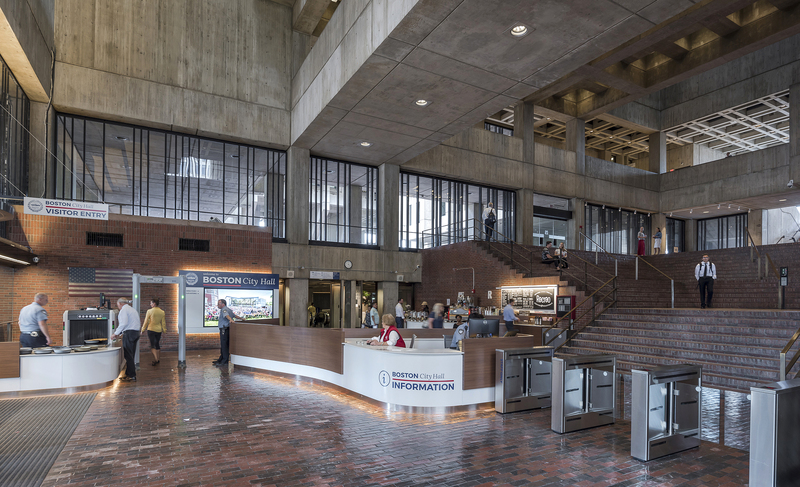 Utile, working with the City of Boston Public Facilities Department and Lam Partners, recently completed renovations to the Boston City Hall main plaza-level lobby to create a more open, inviting, and efficient entrance to the 1960s brutalist building. The project included redesigning the security sequence, adding a coffee shop and comfortable seating for visitors, and replacing the non-functioning original lighting with highly-efficient LEDs. Art installations and a large video board streaming city news and updates also help to liven the concrete interior. Additionally, Utile worked closely with DoIT, the City of Boston’s Innovation and Technology Department, and interactive design studio Small Design Firm, to design new wayfinding elements in the main lobby and elevator lobbies throughout the building utilizing the City of Boston’s new graphic identity. Boston Mayor Martin Walsh said in a statement, “We’re dedicated to making Boston City Hall a positive, welcoming experience for all residents, and this renovation is another leap forward. City Hall is a historic building that belongs to everyone, and I’m pleased that our renovations improve experiences for all visitors.” Ben Thompson of The Boston Globe covers in-depth project details and user reactions in his article, ‘People are excited about it’: Officials unveil revamped City Hall lobby.